There are many ways to discover our old city: A walk in the old quarters, the old trams of Lisbon or, if you prefer, a trip to Cacilhas just to enjoy the views. I’ve mentioned several times that the light in Lisbon is different from every point, and if you get on a boat on a sunny day, the reflection in the river and the views of Lisbon are breathtaking. 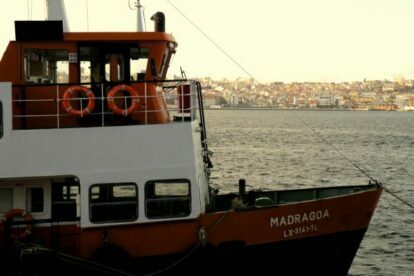 You must definitely see Lisbon from the Tagus river and enjoy a relaxing boat trip. I recommend you take a trip to “the other band” (as we call the other side of the river), to Cacilhas for example – there are several fishermen’s restaurants there, so you can have seafood. Walk on the deck to enjoy the views. From here, you can see the whole town from a different perspective. It’s only a cheap 12 minutes trip on a traditional old “Cacilheiro” boat, you’ll enjoy every second!